Which platform for Regular Index Fund Investing? 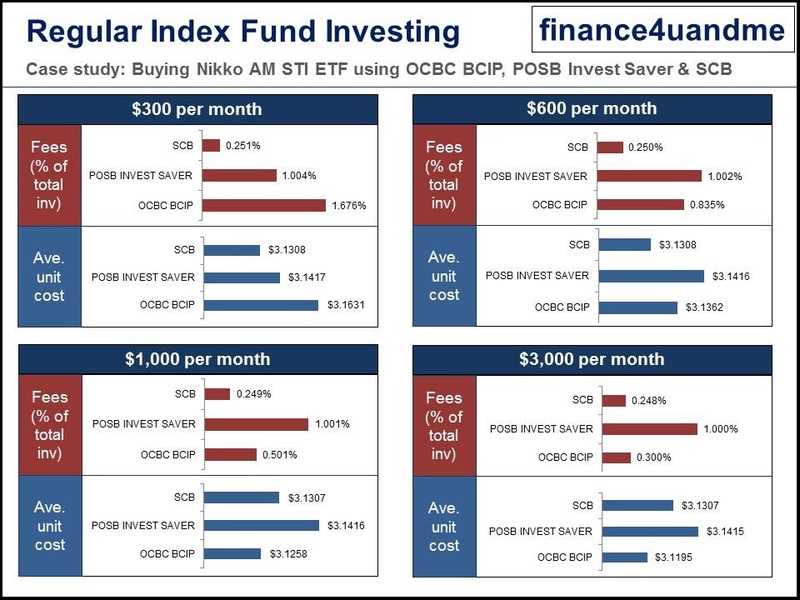 For my analysis, there are two regular savings plan (RSP), OCBC BCIP and POSB Invest Saver, which purchase shares and the third one is a manual investment via SCB online equities trading platform which purchases shares in lots. SCB equity online trading (manual) – Lowest fees. While SCB equity online trading offers the lowest fees, RSP helps to take one’s emotion out of the equation which I feel is very important. Please feel free to comment and also share other methods of index fund investing. Was just wondering why you have not considered the SPDR STI ETF? The fund fees seems to be lower at 0.30% compared to 0.39% for Nikko AM. There’s also the Phillip Capital Sharebuilder Plan which allows one to DCA into SPDR STI ETF. I used Nikko AM STI ETF because its lot size is 100 units and. Come 19th Jan 2015, SPDR STI ETF would definitely be my choice. This analysis was mainly for budget below $1,000, ie myself, to gauge which platform will cost the most in fees. Philips Capital’s Sharebuilder Plan charges at least a minimum of $6 if it less than one counter and charges 1% fee on dividends. Overall, one’s investment will be lowered from all the fees. I always welcome suggestions other platforms or modes of DCA. Howdy fellow index investor. Awesome post! I will put a link to yours from my blog. At current fees, it is difficult to beat StandChart apart from the fact that it isn’t automated. Thank you for your comments and putting a link to your blog! Your blog looks good and aesthetically pleasing!! Actually, in truth, I have not really started on index investing. Am currently contemplating investing for my son for his future education fund. This is the problem with manual index fund investing via the SCB online equities platform. Actually I think the greatest advantage of DCA is that human involvement is reduced to a bare minimum. That is the only thing that prevents an investor from having different returns from the market. If you have to manually buy it yourself for SCB, you might be swayed by market sentiments and start second guessing yourself. Do I wait a day later to get in cheaper? Do I wait for the bad news to be over? If you don’t trust yourself enough to analysis stocks, how can you trust yourself to be emotionally stable enough to keep buying the index rain or shine? Thank you for popping by my blog! I totally agree with the emotional portion of DCA. It removes all emotion and it is in auto-pilot mode. SPDR is good. Just that for the analysis, I used Nikko AM STI ETF which is available on the 3 platforms so that its an equivalent comparison.